James Tobin was a leading - perhaps the leading - American neo-Keynesian macroeconomist in the era of Keynesian dominance after World War II that extended through to the early 1970s. Along with growth theorist Robert Solow and micro and trade theorist Paul Samuelson, the three substantially shaped what became known as the neoclassical synthesis which fused neoclassical microeconomic theory, Keynesian macro theory, and neoclassical growth theory. The macroeconomic component of the neoclassical synthesis is termed neo-Keynesianism. All three received the Royal Bank of Sweden Prize in Economic Science in Memory of Alfred Nobel, with Tobin winning his prize in 1981. 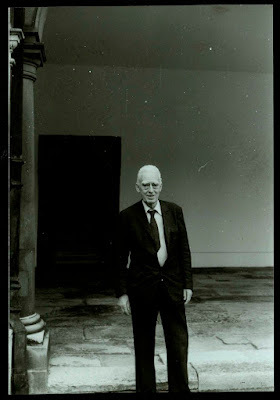 Tobin died in 2002, aged 84. 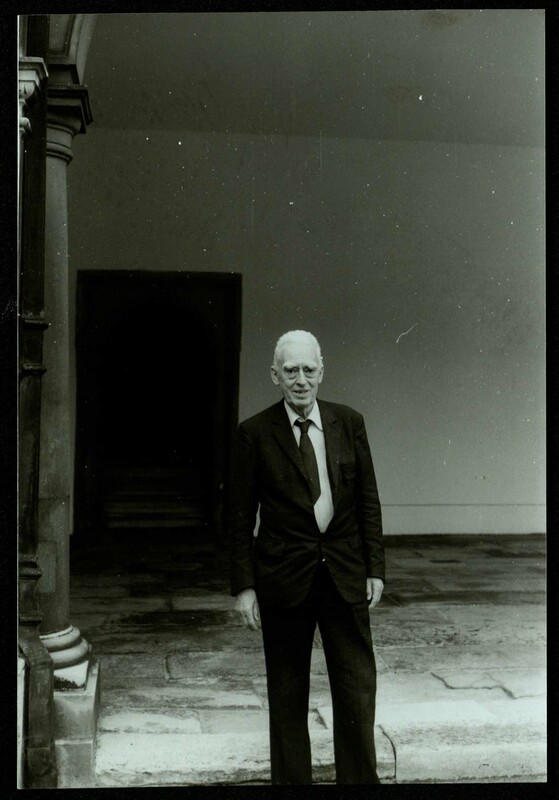 Robert Dimand (2014) has written a short book, which is part of The Great Thinkers in Economics series edited by Tony Thirlwall, on Tobin’s economics. For purposes of truth in advertising, it should be noted that Dimand was a student of Tobin’s at Yale University and wrote his dissertation under Tobin’s supervision. Like so many students who studied under Tobin, Dimand clearly has an abiding deep respect and admiration for Tobin, as does this reviewer. I don't normally post about this stuff, but the possible implications of this technological change are far reaching, not just in terms of safety as implied in the video (somewhat promotional; hey, it's WIRED), but also in terms of employment. 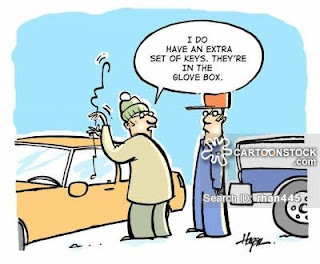 Jimmy Hoffa is turning on his grave, wherever that is. The original WIRED piece here. According to the BEA, the advance estimate of GDP growth in the third quarter is 2.9%, which is a significant improvement on the second quarter (1.4%). So maybe there is no recession in the near future (Neil Irwin might be right about that), which does not mean Yellen should hike the Fed rate in December anyway. Next semester I'll be teaching a senior seminar on the history of central banks. The idea is to blend economic history, history of economics ideas and monetary theory in equal parts. And I decided to post on some of the topics I'll discuss in the class, very much like Robert Paul Wolff's tutorials in his blog The Philosopher's Stone, but probably in a less instructive and interesting way than the ones he posts (see this multi-part tutorial on Marx that starts here, and continues here and here and so on; last of nineteen parts here). In the same spirit, I'll suggest some readings for those interested in the topic. An obvious place to start is with the paper "The changing role of central banks" by Charles Goodhart, or for an alternative interpretation by yours truly go here. Central banks are among the oldest institutions employed for macroeconomic policy management around the world. The oldest central banks are old indeed (as can be seen in the table below, from Capie, Fischer, Goodhart and Schnadt's book The Future of Central Banking*). They precede monetary theory and macroeconomics as fields of study. More surprisingly, central banks even came before the development a more coherent set of general economic principles, developed by classical political economy authors. 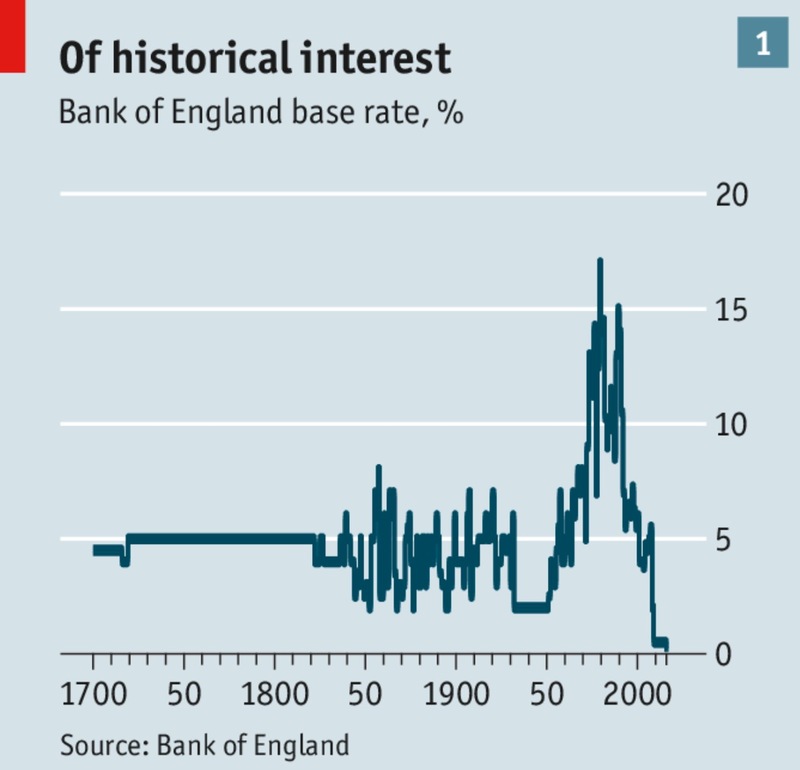 The defense of the need for central banks in the 17th century, when the Sveriges Riksbank (the National Bank of Sweden) and then the Bank of England were created, rested in the hands of that less coherent, but no less assertive, group of merchants and public servants known as mercantilists. Banks obviously preceded the appearance of central banks, but more often than not, they did not have the capacity to issue bank notes, which would become a distinctive characteristic of monetary authorities. It is clear that full-fledged central banks are a 17th century phenomenon, and they are broadly speaking, institutions that appear at a particular period in the development of certain European economies, associated with the transition from feudalism to the mercantile phase of the capitalist system. England, more than Sweden, is the quintessential experience in terms of successful institutional innovation, and the use of the Bank of England (BoE) as an instrument to finance the state, in particular its immediate needs to fight a war with France, and more generally as an instrument in the process of economic development are hallmarks of the English model. None other than Adam Smith, an ardent critic of monopolies in general, was very keen about the Bank of England, a quasi-monopoly after all, arguing that it was “the greatest bank of circulation in Europe” and that it acted “not only as an ordinary bank, but as a great engine of the state.” In this view, at least, Smith was in accordance with several mercantilist authors, which, otherwise, he criticized harshly. Smith was apparently concerned that competition, meaning free entry, in the banking sector would lead to a multitude of undercapitalized “beggarly bankers” that would, in turn, lead to a heightened risk of “frequent bankruptcies.” However, Smith’s views are less contradictory than one might think, since the modern ideas of market efficiency have less to do with the theories developed in the late 18th century and early part of the following by classical political economy authors, than with the marginalist ideas developed in the last quarter of the 19th century. In particular, for Smith efficiency or the division of labor is connected to the broader question of capital accumulation and the wealth of nations, rather than the narrow question of allocative efficiency, and the notion that resources are fully utilized. Further, Smith suggests that efficiency is ultimately dependent on the expansion of demand, or in his words that “the division of labor is limited by the size of the markets.” In that sense, not only did Smith emphasize the forces of demand, rather than supply in the process of long run growth, but also he was aware of the existence of processes of cumulative causation. His famous vent for surplus is the typical example of a cumulative process. Larger markets for British goods would lead to the necessity to provide for increasing demand and lead to an improvement of the conditions of production, an expansion of the division of labor, which would lead to cheaper and higher quality products, which, in turn, would lead to higher demand. The demand-led process of accumulation suggests that Smith was well aware that institutions that favored and facilitated the access to markets and allowed for the expansion of demand were an important element in the development of market economies. Further, the idea of cumulative causation suggests that size and scale matter, and that increasing returns are a pervasive feature of market economies. Hence, the Bank of England, which was at the center of financial development, which allowed the expansion of international trade ventures, and more directly through its role in financing the state and the naval expansion of England, opening markets for British products, was an essential element for capital accumulation. Smith was, as much as the mercantilist authors that he criticized, very much in favor of the expansion of markets, which accounts for his favorable views about the Bank. Nevertheless, it would be the role of the BoE during the inconvertibility period (1797-1821), associated with the Napoleonic Wars, that would indelibly mark the views about the Bank, and hence much of what economists think about central banks, in the minds of latter generations. The inconvertibility period led to the famous Bullionist Controversy, central for the development of monetary theory. The acceleration of inflation marked this period, and several authors known as Bullionists, most prominently David Ricardo, would be critical of the Bank’s policies. Bullionists, a name derived from their call to a return to the Gold Standard (i.e. bullion), argued that inflation was caused by the overissuing of paper money by the Bank. Bullionists saw the return to the Gold Standard as a necessary step to maintain price stability. Central banks should not control money supply, and the solution demanded a strict impersonal rule to provide price stability. 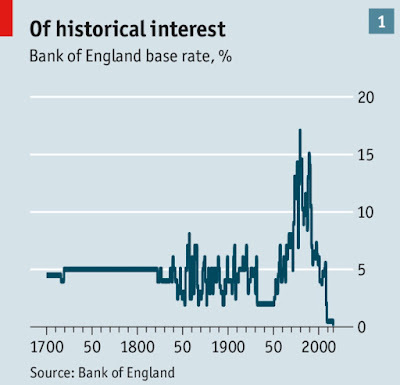 The idea that the Bank of England had to be the guardian of the value of the pound, and that price stability was paramount was enshrined in this particular period. Interestingly enough, the Bank of England still did not have during the Bullionist Controversy the monopoly of the issuing of bank notes, which would only be obtained after Sir Robert Peel’s Bank Act of 1844. The Bank Act, which separated the banking and issuing departments of the Bank to guarantee that overissue would not take place, consolidated the modern concept of central banks and established that price stability would be the only policy concern. The additional feature of the Victorian central bank was the increasing preoccupation with financial stability, which resulted from the frequent crises, and which led to the development of the role of the lender of last resort (LOLR), advanced by Henry Thornton and later by Walter Bagehot. 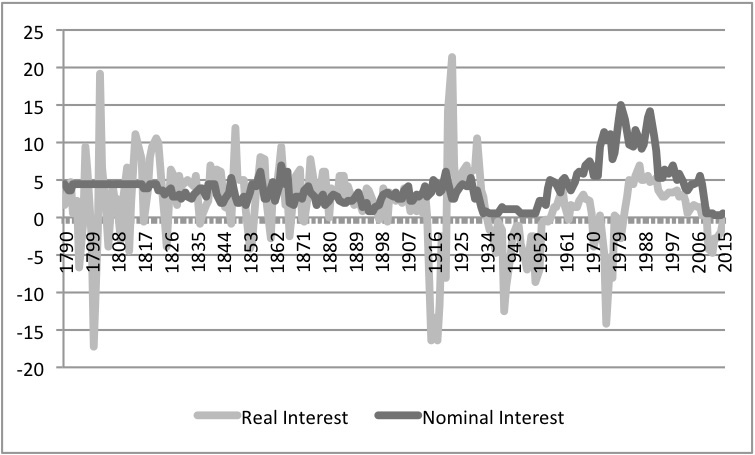 The Victorian view of central banks was only challenged in the 1930s, in the aftermath of the Great Depression and as a result of the Keynesian Revolution (something discussed in this paper). But in the last thirty years or so the Victorian view of central banks, concerned only with inflation, has been reestablished, even if the theoretical justification is slightly different. The last global crisis has undermined the theoretical basis for the Independent Central Bank (ICB) and Inflation Targeting (IT), and the widespread use of unconventional policies (like Quantitative Easing, QE) indicated a certain degree of flexibility in the face of the crisis, but there has been little institutional change. In the next post (in the tutorial) I will deal with the era before central banks, and the reasons for their emergence. 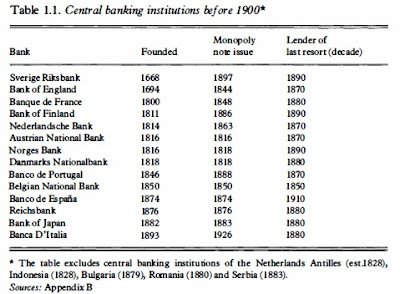 * The First and Second Banks of the United States are not included in the table, but could certainly be considered as part of the club of early central banks. The new Bank for International Settlements (BIS) Triennial Central Bank Survey was published last month. The Foreign exchange turnover is down for the first time since they started in 1996. As the press release says: "Trading in FX markets averaged $5.1 trillion per day in April 2016. This is down from $5.4 trillion in April 2013." The figure below shows the main results. 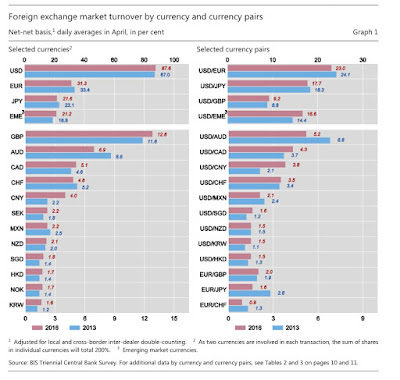 Not surprisingly the dollar remained the key vehicle currency, being on one side of around 88% of all trades, while the euro has continued to slide down approximately from 39% in 2010 to 31% now. 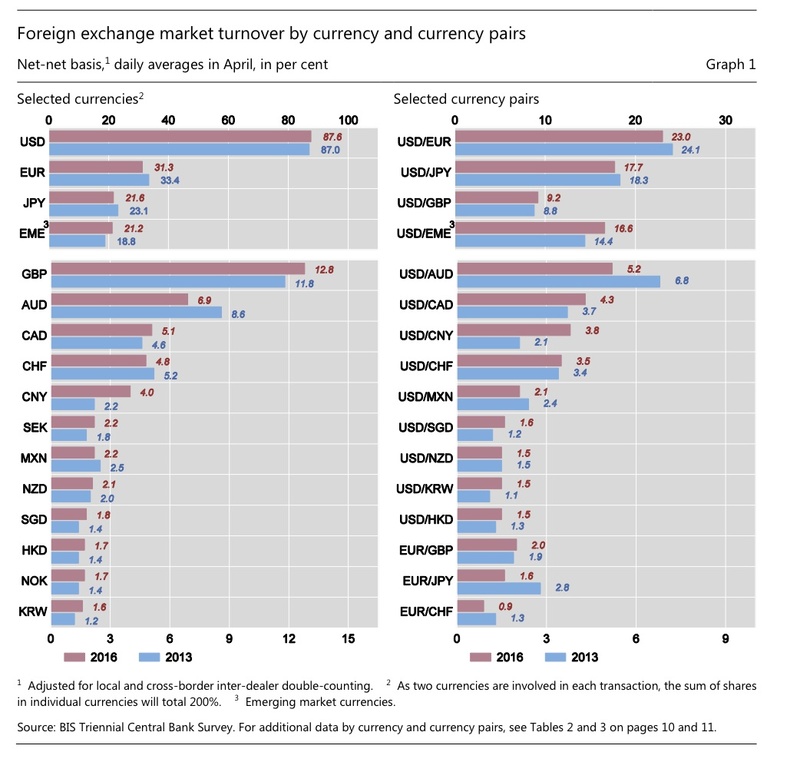 Also, while the yuan or renminbi is now the most actively traded developing country currency, the rise in the share in global foreign exchange turnover is from 2.2% to 4%. PS: For those interested here there is an old paper, but I think still relevant, on the dollar after the crisis, and why there should be no fear about its dominant position. 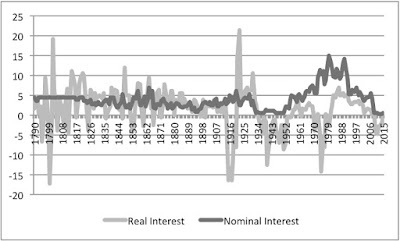 In other words, large deficits and debt will compete with funds for other activities, the savings glut which a good chunk of the profession thinks causes low interest rates will vanish, and this, in turn, will increase interest rates, which not only will increase the interest rate burden, but also will reduce the fiscal space to spend on things we agree are fine, like infrastructure. What should we do according to them? No surprise here, cut social spending. In their words: "A realistic approach toward the major entitlement programs is required, given that they are projected to account for all of the growth of future noninterest spending." They fall short of asking for privatization of Social Security, but you can bet that this is what they are going to push for in a Clinton administration. To finish the work they started in the previous Clintocracy (the system of government in which a Clinton holds power). I discussed fiscal issues several times here, and the problem in their argument is with basic principles really. 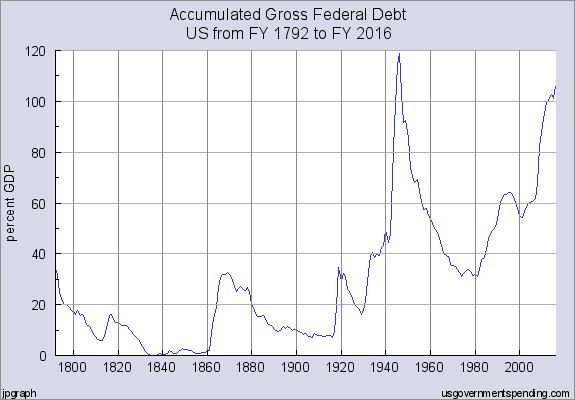 Below Gross Federal Debt, which stands at slightly more than 100% of GDP, and once the amounts of public held by the Fed and in the Social Security Trust Fund and other government accounts are accounted for, then this leaves us with the Net debt of about the size reported by Volcker and Peterson in their piece. Looking at the figure you might be alarmed. It has increased significantly after the last crisis. However, there are important elements that suggest that the increase in public debt is not problematic. First of all, as noted by Dean Baker, the burden of debt service (interest payments) is tiny. And will most likely remain low, since the space for normalization of interest rates is much smaller than what Volcker and Peterson suggest. The idea that government spending will grow out of line with the ability to finance it (which has little to do with the "private's sector capacity to save," btw) is difficult to believe too. Note that government spending has been subdued as the graph below shows. Government spending in real terms remains below the pre-crisis level, and after the fiscal package, Obama has essentially followed the Clintonomics rule book of fiscal conservatism. If anything spending is kind of small, for the needs of the economy (I would say spending, and not deficits, since the result is endogenous, but I agree in general terms with the argument here). There is no problem of runaway government spending, and certainly no danger, as Volcker and Peterson suggest that "we would risk returning with a vengeance to stagflation — the ugly combination of inflation and economic stagnation that we tasted in the 1970s" if we do not cut social spending. This is the old trick of creating fear of a fake fiscal crisis to force cuts on spending for social programs. My fear is that Volcker and Peterson, and others like them, will have an outsized influence on a Clinton administration. The danger is not the high inflation of the 1970s, but the completion of the neoliberal project of the 1990s. 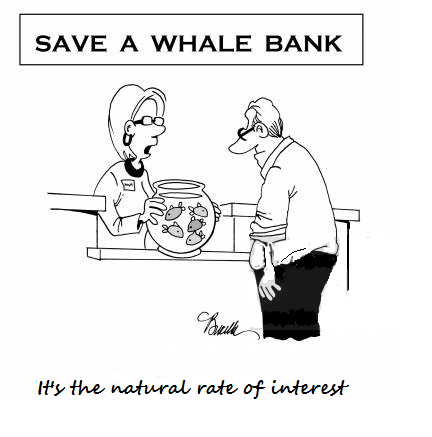 The persistence of low interest rates has dominated the news. In general related to whether the Fed will or will not increase the interest rate by the end of the year. 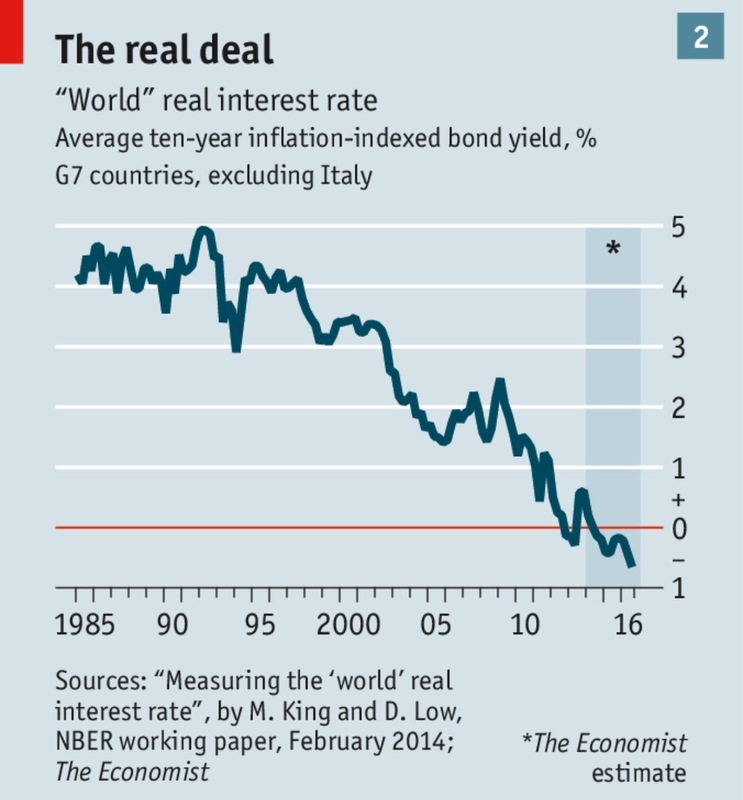 The Economist tried a few weeks ago to put things in perspective, and suggested not only that the current nominal rates close to zero are unprecedented, but it sort of indicated that the negative real rates are also to some extent a new phenomenon. The explanations for low rates can be found here, and the consequences, according to The Economist here (btw, for them is a pension crisis; and yeah, just wait this will be used to call for privatization). I'm not particular keen, as you know, on the idea of a savings glut, as an explanation for the low rates. The reason is much simpler and is associated to the fall out from the previous crisis. But at any rate I just wanted to check the data. They showed the nominal short term rate in the UK (below), which is not very different from what can be found in other sources used here before (like this one). However, they only show the real rate for the last three decades or so (see below). This seems to suggest, even though is never quite stated, that the current trend, with lower real rates is also unprecedented. But that is not the case. In fact, what is really unprecedented is the fact that in previous eras of low or negative real rates, as far as I can judge from the data, were caused by relatively high levels of inflation, while now it is essentially the result of very low nominal rates (see below for previous eras of low or negative real rates; btw, my graph matches theirs, but the period is shorter for the nominal rate, and way longer for the real rate). This seems to suggest to me that the explanation must be related to the short term nominal rate, which is a policy decision of the central bank, rather than something that affects the levels of inflation, and according to some theories (the loanable funds) what that does to savings. If I'm right then, the cause of the low rates is the financial excess of the last three decades, that forced central banks to keep rates low to save the economy, and preclude further problems. Very unlikely that would change any time soon. This is a bit old. The Economic Report of the President was published a while ago. I just was looking recently, essentially because it has a chapter on the 70th anniversary of the Council of Economic Advisers (CEA). The report discusses the role of Leon Keyserling, the second chair of the CEA, but the most relevant one in the early period, who, like Eccles at the Fed, tends to be a relatively underestimated and forgotten influence on the rise of Keynesian economics (that's in this chapter). That is enough to make this Report worth reading. But the first chapter (on inclusive growth) tackles the issue of inequality, and not just income, but wealth too. 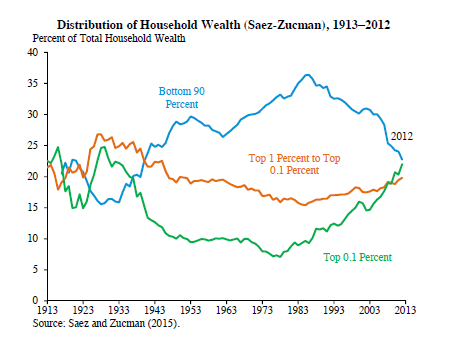 Below the shares in wealth distribution for the top 0.1%, 1% and the bottom 90%. It's very clear that while the New Deal compressed the shares of the top groups, the Reagan Revolution has completely reversed the earlier achievements. 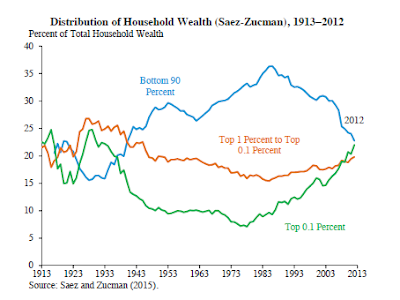 And it is also clear that inequality is important also at the top, since the 0.1% do so much better than the 1%. And the early Keynesians like Keyserling and Eccles were partially responsible for the improvement in wealth and income equality back then. 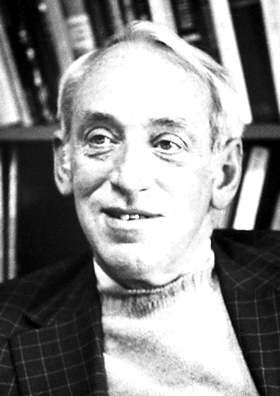 Prebisch believed that understanding the evolution of capitalist economies over time and in different contexts required a general cycle approach, encompassing all the different areas of economic activity, which he labelled “economic dynamics.” This theory, developed between 1945 and 1949, stemmed from a critique of both neoclassical and Keynesian theories, which Prebisch viewed as static representations of capitalism. It was applied first to a closed economy and then to a centre-periphery context. The theory combined the notion that profit is the driving force of economic activity, with a process of forced savings and the idea that the time lag between income circulation (and the resulting demand) and the completion of the production process are the main source of cyclical fluctuations. Prebisch’s dynamics theory, which he never completed, influenced his “development manifesto” (Prebisch, 1950). His point is that while there are good reasons to believe in the forces of stagnation, the reasons are not the Wicksellian ones given in New Keynesian models. Worth reading. I received an e-mail from an undergraduate economics student who was curious about economic policy in Washington, DC. His question says a lot about the current state of affairs. Here it is with my reply. I am a first-year undergraduate in economics and political theory, and a longtime admirer of your work. What are your thoughts on how Keynesian/Post-Keynesian ideas are treated in current political discourse? Does it worry you that ideas which used to be considered “mainstream” (like social democracy) are now increasingly considered “extreme”?